This is a great, refreshing smoothie. Experiment with the flavors because the fresh ingredients are very versatile. Put everything in a Vitamix or high powered blender and mix until completely pulverized. Put in a mason jar with a lid. Because you are keeping the whole apple and including greens, it will have a fairly heavy consistency to it. If it begins to settle, continue to shake. Here is a good selection of juicer recipes. Feel free to add greens or greens powder to any of the recipes for added nutrition. If you put the beet in it is very, very red but tastes great. Juice the apple and ginger together, then juice the pineapple and serve. 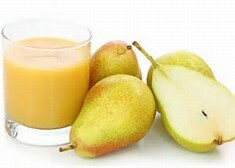 Process the fruit in a juicer and serve. K- Onions/spinach w/ fried eggs (I sauté the veggies and crack the eggs right in the pan with them. I usually break the yolk but you can leave them sunny side up. 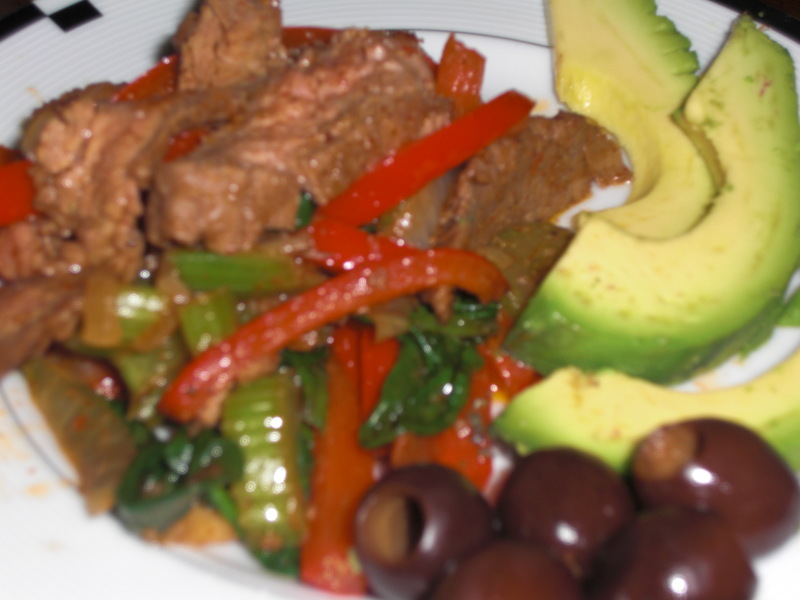 F&K – grass fed steak fajitas w/ avocado – grassfed flank steak (purchased from http://www.whiteoakpastures.com/). Marinated in apple cider vinegar, olive oil, salt, pepper, spike seasoning overnight. Cooked on cast iron grill pan. Sauteed sliced red bell pepper, onion, and celery in butter in a cast iron pan, added spinach at the last minute. 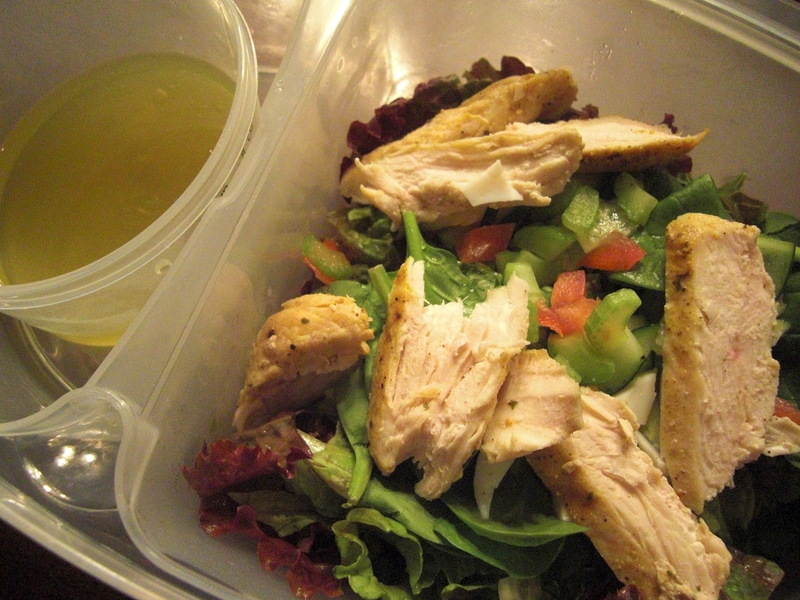 F&K- Grilled Chicken Salad – organic chicken put between parchment and pounded to about ½” thickness. Seasoned with organic seasoning mix, salt, and black pepper. Grilled on cast iron grill pan. Salad- red leaf lettuce, black olives, ½ tomato (tomatoes in moderation), cucumber, celery, onion, hearts of palm, slivered almonds with oil & vinegar. K- romaine with cucumbers, zucchini, red onion, black olives, broccoli, celery, oil&vinegar and bowl of vegetable soup. 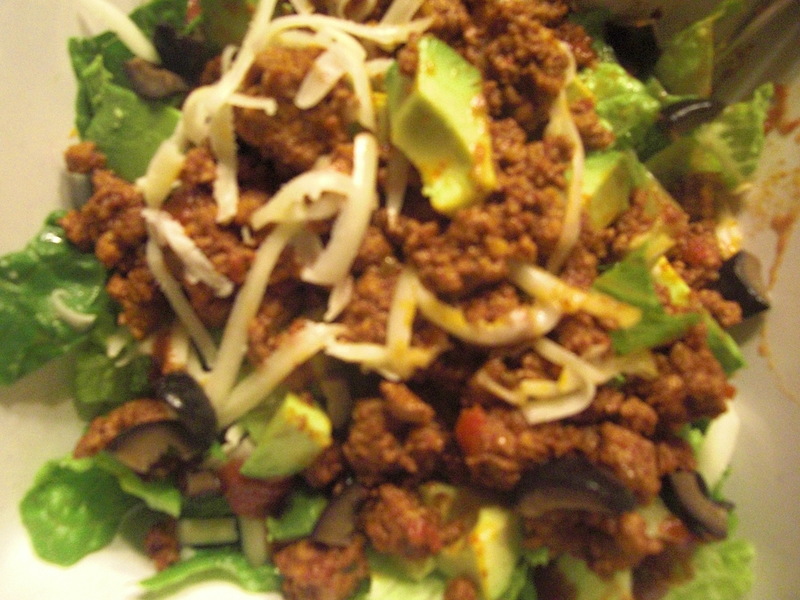 F & K- taco salad- grass fed ground beef (from Publix) + taco seasoning recipe from the book with shredded raw cheddar cheese (from Nature’s Corner Market), whole avocado, black olives, cucumbers, salsa for dressing.